Atlanta’s Rebuild Binder is the full monty of reboot. The theory is they’ll be ready to compete next year when they move into their new suburban stadium. Strikes me that plan is working about as well as the last time folks moved out of Atlanta. Fitting that the Reds won on a bases loaded walk, one of eight free passes given up by Atlanta pitchers. Super (Two) Start Daniel Wright had made four – four – starts above A before tonight. His sole major league start came in Los Angeles against the Dodgers. He lasted three innings tonight. His ERA/FIP is 7.62/4.65. Six innings from the Reds bullpen is not a promising formula. Here’s hoping this spot in the rotation will be filled by Cody Reed next time. 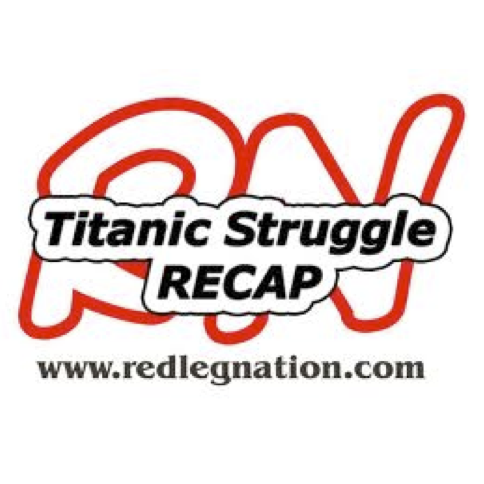 Reed pitched for Louisville tonight and went six innings, giving up three hits, a run and two walks. He struck out 5. Reed threw 83 pitches. One-Two Punch The Reds got on the board in the first inning with a walk to Zack Cozart, a triple by Jay Bruce and a home run by Adam Duvall. 3-0 good guys. Jay Bruce is leading the major leagues with six triples. Duvall is second the NL in home runs. Bruce and Duvall are in or near the top five in the NL in extra base hits and slugging. Coming into tonight, they were first (Duvall) and second in isolated power. Duvall drove in another run with a sacrifice fly in the third inning. Another Lead The Reds retook the lead in the sixth with two runs. Eugenio Suarez (who earlier had a sac fly RBI) and Tyler Holt led off with singles. Suarez scored on a single by pinch hitter Kyle Waldrop. Holt scored on a wild pitch. Bullpen Artists J.C. Ramirez pitched two innings and gave up a two-run homer to Freddie Freeman. Ramirez’s ERA/FIP is 7.20/5.15. Blake Wood pitched the sixth and seventh. He gave up a walk and struck out three. His ERA/FIP is 3.51/.3.02. Ross Ohlendorf pitched the eighth and gave up a game-tying home run to the lead-off hitter. He loaded the bases with one out before working out of the jam. Tony Cingrani pitched the ninth with a one-run lead and retired the heart of the Atlanta order 1-2-3 on three ground balls. Knock on WoodÃ‚Â Blake Wood has now pitched 62.2 innings without giving up a home run, dating back to August 2011. That’s the longest active homer-free streak by innings in MLB. The Reds bullpen has surrendered 46Ã‚Â 47Ã‚Â 48 homers, the most by far (Twins second most at 34) in the major leagues. It’s hard to believe Wood has escaped contributing to that dishonor. Dumb LineupÃ‚Â Lineups don’t matter much, sure. But when it’s easy to grab a small edge, why not? The Reds have hit Brandon Phillips ahead of Adam Duvall all year. Phillips is a well below average hitter and has been for several years. Yet he bats third or fourth every game. Meanwhile Adam Duvall has been one of the best in the NL and doesn’t hit above fifth. Phillips struck out on a pitch that bounced in the LH batters box in the ninth inning. Just talked to Lorenzen, he will pitch again Wednesday. Go back-to-back Saturday and Sunday and should then rejoin the Reds.Ã‚Â Said he anticipates his velocity being higher as a reliever (obviously). Also said knows he can start, but is fine with whatever Reds want.Ã‚Â He sat 96 MPH today. Topped out at 98. Thanks for the last bit of reporting on Mike Lorenzen. Here’s hoping his elbow is fine and he’s back with the Reds in a week to 10 days. Soon Iglesias and then Homer. Pitching staff is starting to round into shape…….at last. Suarez has walked in 3 straight games and took another 3-2 that looked inside and got very upset when they rang him up! 12-41 with 5 walks in the last 12 games (.370 obp). He also made some really nice defensive plays yesterday and maybe could become average defensively at some point? Baby steps! Yeah, that game before last was stellar defensively for Suarez. The physical skill is in there… he just needs repetition and mental focus, I think. I feel he can still be an average defender and above-average hitter. I haven’t sold all my shares yet! I hope you are right that he can become an average defender because to this point I just cringe when the ball is hit to him. When Zach went down last year I quickly came to realize how much I took his defense for granted. The first 5,000 fans should get the “Deliberate Dysfunction” bobble head series. I agree. What a great title for the recap too! Of course, 5,000 fans might be a little ambitious. Eight walks by Reds hitters is a good sign. Good ABs by both Selsky and Waldrop tonight. It will be interesting to see how this bench situation shakes out if/ when all hands are healthy (3 three MLB pitchers still out plus BHam/YRod). Right now they have 12 pitchers and 13 position players. I think the split stays the same. There are lots of ways they could go on the pitching side. On the position side, the decision is probably whether they want the 3rd catcher or 5 OF. Duvall’s ability to cover 3B/ 1B at least short term and the same for Suarez at SS means they probably only need the one true infield sub; plus Selky plays some at 1B too. Then of course there could be a trade (or three) that would turn everything upside down and inside out. The Braves were slightly worse in the pitching department tonight. 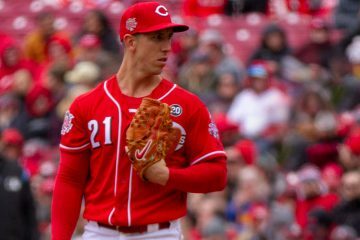 But Reds were sufficiently bad themselves that despite B.Price’s statements about easing Lorenzen and Iggy into things, I’m guessing once they are sitting in his pen on the active roster, it is not going to take long for him to start using them when the game is in the balance. Steve, you read my mind: I’m watching and thinking why is BP batting ahead of Duvall? Makes no sense. Good observation. I agree about BP and Duvall, and am a Duvall fan (great catch, too), but can’t resist pointing out that, by RLN standards, he’s not an unambiguously good hitter. Last time I noticed, his OBP was under .300. RLN “standard” (if such a thing existed) would be wRC+ or wOBA or another total offense category. OBP is simply a component. Overall, Duvall has been fantastic because of his elite power. If you have elite power, you don’t need OBP to be good. I am not a baseball manager, but my guess as to why Duvall is not batting third would be his SO%. Duvall sitting at 29%. Votto is 26%, with Bruce 20%. Phillips is likely where he is in the lineup for his contact. Phillips SO rate is 13%. Right. The crux is that a guy with an OPS barely above .700 (and falling) should not be batting 3rd. I wish he would get that upset when he refuses to get in front of grounders and costs the team runs !!!! Yeah, but I’ve actually noticed this with a lot of MLB infielders now. I think they are being taught to field grounders this way, especially on the corners. I don’t know if it’s to avoid them being injured or what. I know I don’t like it because as you said, just keeping the ball in front of you at 1B can often still result in an out. Where is Tom Emanski when you need him? Out having a drink with the Crime Dog. That annoys me too but this was a ground ball right at him that went under his glove. He has played crappy defense this year. UZR has him as an above-average 1Bman. DRS has him at below-average. I really don’t think he’s been any worse than recent years. His GG year seems like an aberration. He’s average-ish (for a 1Bman). The Old Cossack sees these as 2 seperate issues. I like Duvall hitting in the 5-hole behind Bruce. The problem is Phillips hitting anywhere in the top half of the lineup. Not only are the Reds paying Phillips for prior performances in his prime, the Reds are playing Phillips for prior performances in his prime. Phillips does not seem to translate well from statistical view. But he does not strike out and does not walk. (I guess the reason why the analytics dislike him) He puts the bat on the ball, and thats a good thing in my book. On a side note; Cossak usually refers to himself in the third person narrative when posting….. Is there a reason ? The 3rd person reference probably stems from 3rd person references with the little Cossacks during our daily silly, playful interactions and just translated into the ‘Old Cossack’s’ written observations. Phillip’s plate approach to swinging early and swinging often, does reduce both BB & SO. Last year, Phillips had a particularly effective season (97 OPS+ but still below league average) with this approach and this approach has proven effective for other hitters (see KC). In order for this plate approach to produce effective results, it requires a high BA and a high BAbip. Phillips only produces a league average BA and a league average SLG, despite his high contact rate and a well below league average OBP. That just doesn’t translate into a top of the lineup performance. During his prime years (age 26-30), Phillips plate approach did translate into a top of the lineup performance. Age is a relentless, unsypathetic and unyielding foe. League averages are fine, as a reference, but the roster averages are what Price deals with. Putting Votto, Bruce, and Duvall in order puts three high strikeout players in a row. I just don’t see that as good. Putting the ball in play only matters if good things happen when you put the ball in play. An infield pop up is the same as a strike out, for example. “Analytics” not liking Phillips has nothing to do with him making a lot of contact… it has to do with him making a lot of outs. Making outs is bad. When you put the ball in play with Phillips’ authority, you make an out 70% of the time. That’s not good for a primarily singles hitter. Could it be Adam is comfortable hitting where he is and doesn’t feel pressure. But guys who have made it to the major leagues generally aren’t affected by something like “am I batting 4th or 5th?” I’d think if you’ve mastered being able to hit on national television in front of millions, the lineup order shouldn’t matter much to you. And data agrees with that. Guys hit the same everywhere, given a large enough sample. Yeah BP puts the bat on the ball…..6-4-3 with Votto on 1st? He should be batting 7th or maybe 6th and Hamilton 9th? Knowing this organization I’m afraid they won’t man up and deal with BP next year so he’ll get another 500+ atbats? The bottom line is that BP is still an effective player. I don’t like him in the 2-5 spots in the order though. He can still hit a little; enough for a middle IF in particular. That said, he isn’t a particularly good hitter anymore and hitting him cleanup doesn’t make much sense. But hey, it’s a lost season and maybe they lose 1 more game because he’s hitting there instead of say, 7th? I guess it depends on your definition of “effective.” Phillips has been bad on the base paths this year, which coupled with his hitting and declining defense, has accumulated him -0.3 fWAR thus far. In his defense, his BABIP of .276 is below his career norm and his batted-ball xBABIP by a little. The Old Cossack wants to proclaim the Votto resurgence in full force. Over the past 19 games, Votto has slashed .310/.410/.634. That’s a 1.043 OPS and has raised his BA by .034 points, his OBP by .021 and his SLG by .092. The only flaw remains that stubborn SO%. Even during the recent resurgence, Votto’s SO% has been 24.1% and his BB% has been 13.3%. If Votto can manage his SO% back to career norms of 19% and his BB% back to career norms of 16%, we will have MVP Votto back on the march. All of us know what needs to happen with BP but it won’t happen.He has us hostage and he knows it.We tried to trade him but he refused and it was his right to do so.The front office won’t reduce his playing time nor will they drop him in the batting order.The issue I have is that he is blocking younger players that maybe part of the future of which he is not. I hope it isn’t the FO’s decision about where Phillips hits. Honestly, I’d put my money on Price thinking that BP is still a good hitter and not realizing that batting him 3rd or 4th is lunacy. They’ll prob trade Cozart and Peraza can’t replace both of them? Peraza is only 22 and not tearing up Lville anyway? We’re stuck w/BP but no reason whatsoever they can’t be straight with him and bat him lower? I think Senzel might be the 2B in 2018? I think Peraza will be a super utility guy when he comes up to stay late this year. If he hits, he’ll be the regular 2nd baseman once they get rod of BP (or SS if they trade Cozart). If he doesn’t hit, he’ll remain the utility guy. I was perusing the standings today and noticed that the Brewers are just 5 games back from the Wild Card with a record of 30-34. IF the Reds had a better bullpen they could easily have that same record, maybe even better. They are kind of in the same boat as the Reds, they have Braun and Lucroy who probably should be dealt (we have Cozart and Bruce), but only being 5 games back from the Wild Card, how do you sell that to your fanbase? When it comes to that 5 games back, at first glace it’s a tough sell to the fanbase to move Braun and Lucroy. The thing to look at and for the fans to look at though are not just the games behind, but also the number of teams one has to leapfrog in the standings. In the Brewers case, they also need to leap ahead of 4 teams. Those are really long odds and if they are still in that position at or near the deadline, it’s a pretty easy sell to make the trades. On a side note, since we’re talking about BP, he is 8 HR and 12 SB’s away from joining the fairly exclusive 200/200 club for his career. There are less than 50 modern era MLB’ers on that list! Having said that….drop him in the order, lol. Good stuff! A nice accomplishment for BP if he gets there. Odds are that he will if he plays next year and gets decent PT. Personally, I’ve never put much weight in pure counting SB numbers, because if you only have a 70%-72% success rate, you haven’t added any value whatsoever, even if you stole 1000 bases. Yeh I think other than Soriano he’s the only 2nd baseman ever to have a 30/30 HR/SB season. Overall he had an excellent career with the Reds, thru last year. Last night was one of the worst pitched games I have ever seen, considering both teams. That was about normal for the Reds in a game Straily didn’t start but usually the other guys aren’t worse…lol. Wright has nothing….4.50 AA pitcher last year so I have no idea why they think he’s a big league pitcher? Sampson has Arrieta-type stuff compared to Wright. Sampson throws 93-94 and has a nice curve? I thought Price was a pitching guru? Why not work with young guys that actually have some talent as opposed to running out has-beens like Simon or obviously talent deficient guys like Wright or Moscot that are average at best in the minors? From what Price has said, he feels Wright has high upside (much higher than Moscot) and for that reason he DOESN’T want him pitching with the Reds right now. He’ll be back at AA soon. As Steve pointed out, he has almost no experience above A ball. Price has talked about Sampson’s good stuff. He’ll certainly be back (possibly soon) but Price is justifiably frustrated with how poorly he’s pitched for the Reds. Reading between the lines, perhaps Price feels Sampson is not a good listener and has told him you’re going to learn to listen to Ted Power before you come back up. Sampson has been dominating with the Bats lately. Oddly enough, Wright has the lowest BB% of any of our starters. Ohlendorf seemed determined to give away last night’s game, but the Braves stubbornly refused to let him. After the HR and single, he melted down totally and couldn’t throw a strike. A 4 pitch walk, a bunt out (thank you), a 5 pitch walk to load bases with only 1 out. Then he’s 2-0 on M. Smith, but Smith lines out on a pitch that according to GameDay was a low ball 3. Do major league teams still have a take sign ? If Smith let’s that go for 3-0, the Reds were in big trouble. Steve’s description of Ohlendorf “working out of the jam” was generous, though after Smith bailed him out he settled down and got the 3rd out in legit fashion. I’m very eager to see Izzy and Lorenzen in the pen. A lot of good news with the Bats last night. 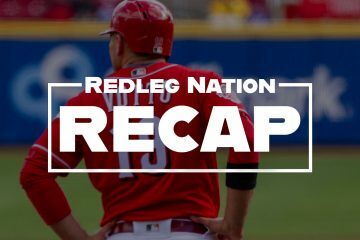 The Cody Reed and Lorenzen news has already been reported above. But also Schebler, who’s been hot lately, went 1-2 with a 2 run triple, 2 walks, and a sac fly. His line has climbed to .282/.331/.492. Hamilton/Schebler In and Pacheco/Waldrop Out would be my call? Schebler has proven he can do some damage at AAA and Waldrop hasn’t. The only reason not to would be if they’re really shipping Bruce off then they prob want Schebler to play every day? I hope that’s not the case? No reason for Pacheco whatsoever? Some positives from last night. Wood’s fastball that struck out Freeman looking was just awesome, a perfect pitch. Freeman leaned out of the way as if it were going to hit him and then it curled over the plate right under his elbow. And I’ve been down on BP all year, with his offense, defense, and still being here, but he threw an absolute laser on the relay from Bruce to nail Aybar at 3rd base. The Reds tv broadcasters called Aybar safe, it didn’t even look like there was a play on him.